Free – booking recommended.A short event exploring the changing history of Birmingham’s Stratford Road, with content from Sampad’s major community heritage project, My Route. My Route explored the richly diverse heritage around Stratford Road, one of Birmingham’s busiest and best-known thoroughfares, identifying changes in the population, landscape and culture over the past 60 years influenced by the settlement and migration of new communities along the road. Around 25,000 Birmingham residents connected with the My Route experience, either as exhibition visitors, participants or volunteers, through a series of lively arts, culture and research activities. This event includes a screening of the My Route documentary, produced by Sampad in partnership with Iconic Productions, followed by an informal panel discussion with internationally-respected Birmingham photographer Vanley Burke, My RouteExhibition Trail Curator Tas Bashir and the My Route project team. The panel will be chaired by Professor Jenny Phillimore FRSA FAcSS, Director of the Institute for Research into Superdiversity (IRiS). You will have a special opportunity to check out My Route’s interactive digital map of Stratford Road which uses touch-screen technology that allows users to unlock the history of the area by tapping into collections of photographs, video & sound-bites. There will also be time to visit My Route’s mini-exhibition in the Atrium at Muirhead Tower (see below) and light refreshments will be available. One of My Route’s main highlights was the My Route Exhibition Trail which reflected and celebrated the social history of the area. 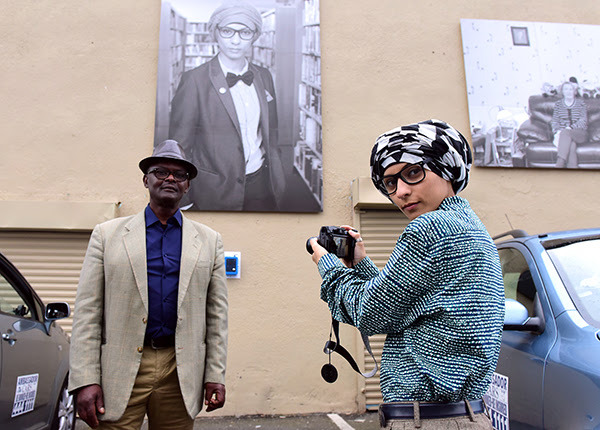 Its main feature was an outdoor exhibition at two key locations along Stratford Road featuring large-scale photographs of eleven everyday people who live & work around the Road. This exhibition features a small selection of the portraits by internationally-respected photographer Vanley Burke, accompanied by personal memories from the people portrayed, in the form of audio clips that can be accessed via ‘sound pods’ designed by pioneering artist Brian Duffy. Previous Previous post: Laptops & Lipstick. Speakers.